I took an UberX from the airport last week, and my driver was awesome. He was from Georgia, the country that straddles Europe and Asia and which used to be part of the Soviet Union. 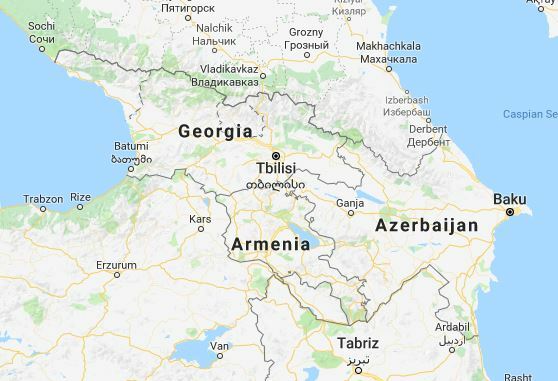 I asked the driver, Irakli, if he missed Georgia. He said he didn’t, except for the food. Soon, we started talking about his favorite restaurant, Jana Grill, on the Newton-Watertown line. I happened to be in the area today and stopped by. The place is clean and has big windows that let in a great deal of sun, a welcome sight during New England winters. The person who took my order was very nice. I noticed right away the charcoal grill, where huge kebabs were sizzling and cooking. That got my heart pumping, and after a long work-out, I was ready for lunch. Meat grilled over a gas flame is fine. Meat cooked on a flat top can be very good. But, charcoal? That’s in a different league, my friends. There’s a reason why cooking sticks of meat over charcoal happens all around the world, as it is a method that has been passed along for millenia. Why? It’s darn good food, filling and almost primal. 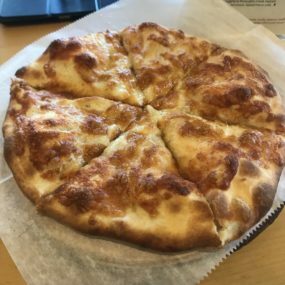 Irakli had recommended the khachapuri, a cheese flatbread. It was awesome. Briny cheese atop homemade dough that had been cooked at a blisteringly high heat. Soon, my losh kebab wrap arrived, which is seasoned ground beef with vegetables and pickles in lavash bread. Now, know that I have a love affair with charcoal-grilled meat on a stick. During a trip to the Soviet Union while in college, our student group stumbled upon a then-illegal street market. A guy was selling kebabs outdoors. Bingo. Maybe it was the exotic location, as we were Americans in Moscow during the Cold War, or the convivial company, for our group of 15 got along very well, but I will never, ever forget how delicious those meat sticks tasted and the smiles on our faces as we ate them. I ordered seconds. Jana’s kebab wrap was tremendous. No, really. 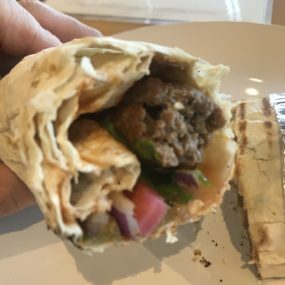 I’ve tried kebabs all around, and theirs is the best I’ve had thus far. It was an ethereal combination of meat, fat, salt, char and smoke. The beef was perfectly cooked and had the right amount of spices. The pickles and vegetables added crunch and contrast, and the thin lavash was warm and delicious. I cut the wrap in half before starting to eat. I took a page from my mother’s playbook. You see, when she ate something new and that she thought we kids would like, she’d leave some for us and bring it home. I was about to pick up one of my kids, and I saved the other half for her. She really liked it. 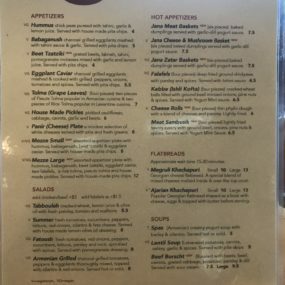 I will be back to Jana Grill, early and often. 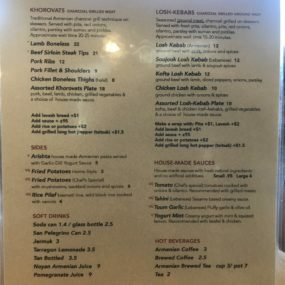 I’ve included photos of the menu in the gallery above. Go check it out, and I think you’ll love the food. There is free parking behind the restaurant, on the Watertown Street side. Food and memory. For a minute there today, it was 1989, and I was in Moscow again.